The annual Pink Dot gathering in support of the LGBTQ community in Singapore is set to return for its 10th year this coming weekend. This year, a varied line-up of local artists will perform at a free concert at the gathering on 21 July to support the freedom to love. Some performers, like Tabitha Nauser, Hirzi and The Apex Project, will be returning to the Pink Dot stage, while Sezairi, .gif, Sobs, MAS1A & Ragga Waka, Subhas, Paper Citizen, Andreas Chua, Vanda Miss Joaqium, Randolf Arriola, Mantravine and DJ KFC make their debut. 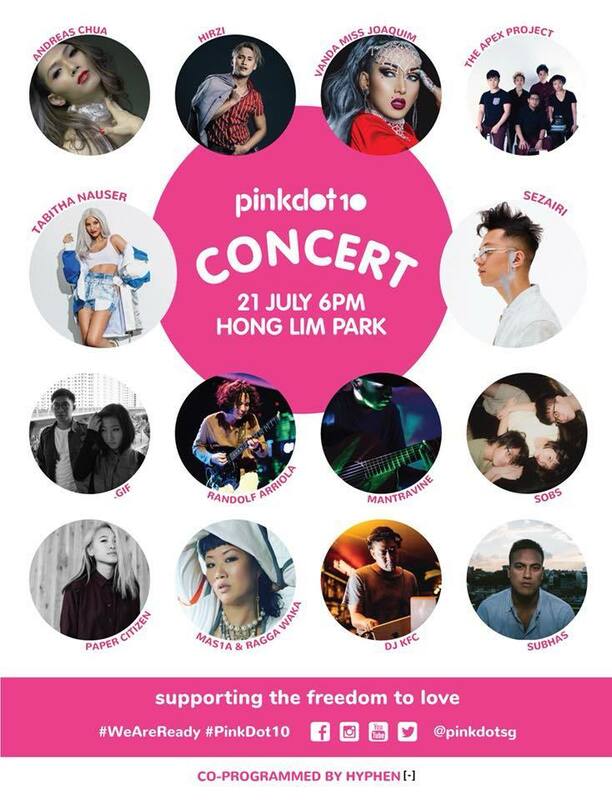 The Pink Dot Concert 2018 will take place at Hong Lim Park from 6pm onwards. Entry is free, although the event is only open to Singaporeans and PRs. For entry, attendees are reminded to bring along their ICs, 11Bs, passports, or Student EZ-Link cards for identification.